B&H assembled this Celestron Labs S10-60 Stereo Microscope Digiscoping Kit to give students and hobbyists the ability to view the microscopic world, then capture photos and videos of the magnified view—for sharing on social media or inclusion on projects. 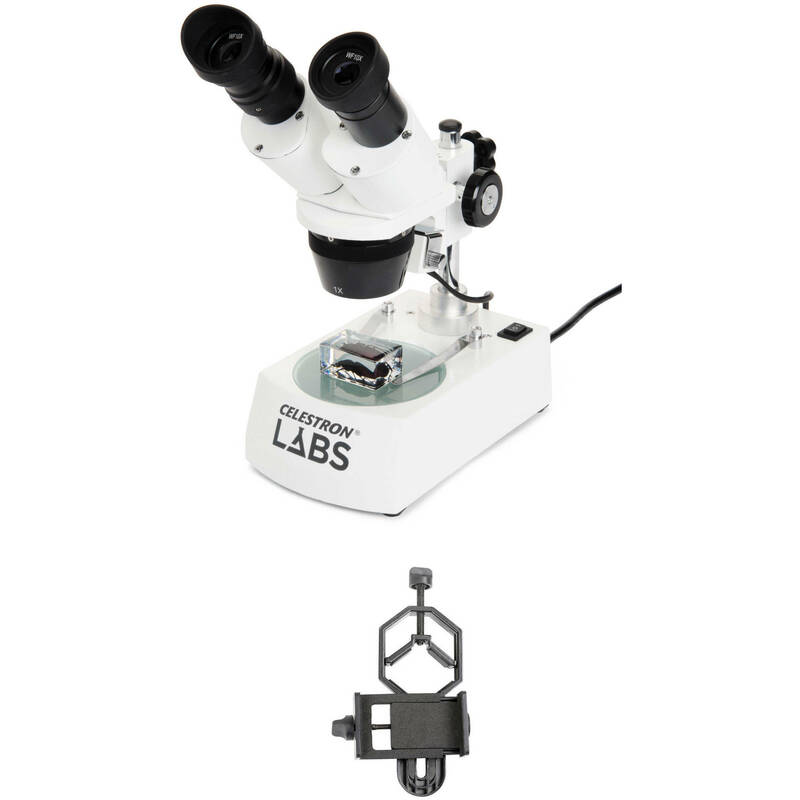 The kit includes the comfortable-to-use binocular microscope and their basic smartphone digiscoping adapter that fits over one of the eyepieces. Designed for students and hobbyists, Celestron Lab's S10-60 Stereo Microscope is a versatile instrument for making detailed 3D observations of a variety of subjects such as coins, minerals, insects, leaves, textiles and documents. Dual eyepieces preserve stereoscopic vision which renders images in three dimensions, as opposed to a flat field common in single-ocular microscopes. Stereo, or dissecting, microscopes traditionally have relatively low power and a large working distance for larger subjects. This instrument has a magnification range from 10x to 60x with a maximum working distance of 2.17". The head and nosepiece are attached to the microscopes' pillar and is easily adjustable to set the correct working distance to achieve the sharpest focus. The stage is built into the base to provide a large and stable area for specimens. Dual light sources above and below the stage and interchangeable stage plates enable users to optimize the light, depending on their subjects. Use the upper light and opaque plate to improve contrast on specimens for better viewing, and the lower light with the translucent plate to illuminate a specimen from below. Capture still images and videos of celestial and terrestrial objects with virtually any smartphone through almost any 1.25" eyepiece with Celestron's Basic Smartphone Digiscoping Adapter. Ideal for telescopes, binoculars, spotting scopes, monoculars, microscopes, and any other type of optic with an eyepieces, the design allows it to be used on most oculars with outside diameters between 29mm (1.14") and 45mm (1.77"). The rigid frame is made of sturdy and lightweight aluminum with non-slip padding on clamping points to secure it to your eyepiece and mount your smartphone without marking or marring its surfaces. A clamping system holds the adapter securely on the eyepiece and locks in place, while an adjustment system allows for precise phone camera alignment. Interpupillary Adjustment 5.7 to 8.2 cm / 2.2 to 3.2"
Box Dimensions (LxWxH) 13.9 x 11.1 x 6.4"